This year Bristol Radical History Group turns its single beady eye onto these icons of the past, so deeply reviled by the rulers of their time. Who were these 'outcasts'? Why are we so fascinated by them? Do their villainous representations carry clues to their real nature? 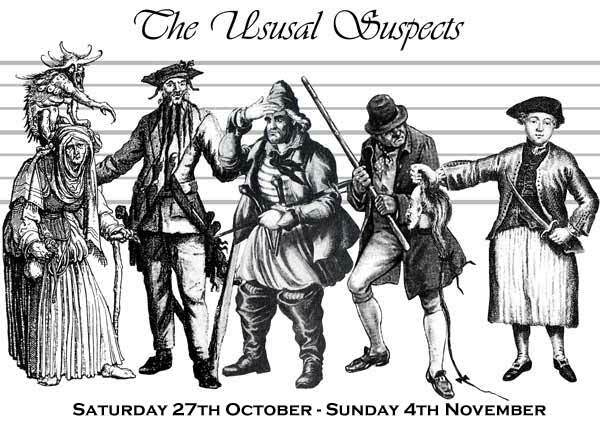 The week kicks off with two days (Sunday 28th and Monday 29th) devoted to the enemies of Customs and Excise, the Smugglers. 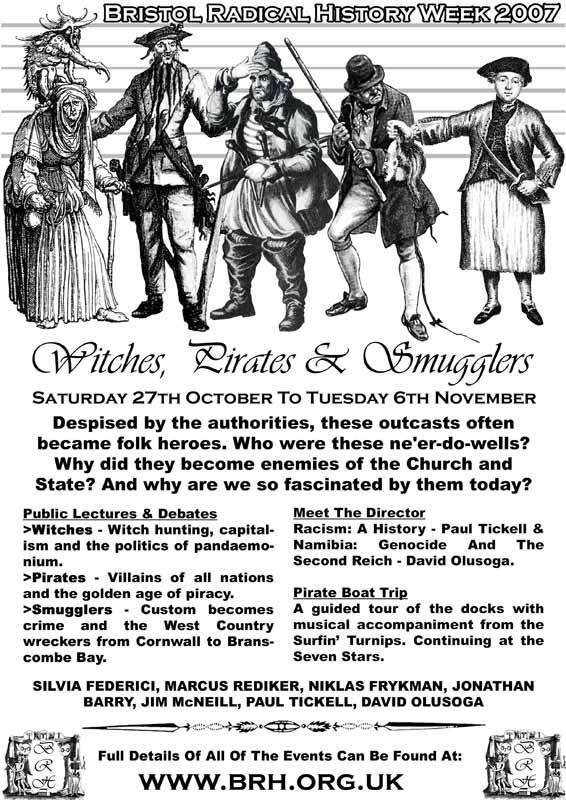 Local historians Jim McNeil, Kev Davis and Dr. Dave Cullum will span the West Country from Gloucester, via Dorset to Cornwall telling stories of wrecking, smuggling and the customary rights of the sea commons. Dr. Trevor Bark brings the story up to date with an investigation of tobacco and alcohol smuggling and the black economy and Roger Ball considers the looting of the cargo of the MSC Napoli at Branscombe Bay earlier this year. We shamelessly hijack Halloween week with a study of demonology and the repression of Witches on Tuesday 30th and Wednesday 31st. Dr. Jonathan Barry examines why 18th C. radicals in Somerset wrote demonological texts to attack the establishment of Church and State (and paid for it with their lives in the Monmouth rebellion). We are delighted to have Sylvia Federici making her first appearance at the History Week. 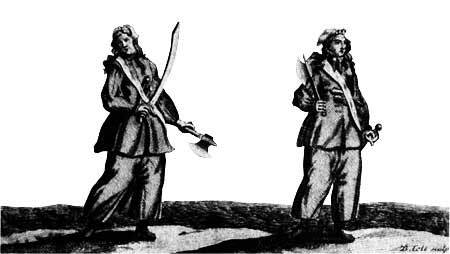 She analyses the witch trials in the 16th and 17th centuries and their connection to control of reproduction, enclosure, the mechanisation of the body and modern day witch-hunts in Africa. The week finishes (Saturday 3rd) with a celebration of Bristol’s finest, the Pirates. Professor Marcus Rediker explains how these ‘villains of all nations’ began as brutalised common seamen, turned pirate and created a multicultural, democratic and egalitarian society under the ‘Jolly Roger’. After last years excellent talk on mutinies, we are very happy to have Niklas Frykman back with a study of the links between piracy and smuggling. We hope to end the week with a voyage round the Bristol docks with skipper Mark Steeds and his cider swilling Surfin’ Turnip crew. And there’s films….Paul Tickell presents his excellent Part 1 of the BBC documentary series ‘The History of Race’ (Thursday 1st) and David Olusoga introduces his film ‘Namibia: Genocide and the Second Reich’ a uncovering of German colonial destruction in Africa (Tuesday 6th). We celebrate the wreckers with Ealing classic Whiskey Galore! (Monday 29th) and don’tmiss our opening night "Merry Hell! : From Jolly Roger To Old Roger" (Saturday 27th). A History Of The Slave Ship With Marcus Rediker Empire & C'wealth Msm. Sun. 4th Nov.* 3:00 pm Lec. Why Remember? Lec. = Lecture; Empire & C'wealth; WS = Workshop; Msm = The Empire And Commonwealth Museum; F/L = Film & Lecture; View = Public viewing of original source material; Soc. = Social event. *While we recommend these events they are not organised by Bristol Radical History Group.